On the day she helped break ground for a joint-venture hospital between HCA and the University of Central Florida, Wendy Brandon, the hospital’s new CEO, announced a $3 million gift to hire a renowned cancer scientist to lead UCF’s cancer efforts. The HCA Endowed Eminent Scholar Chair in Oncology will provide funding for UCF to hire a nationally recognized, academic expert in cancer research. 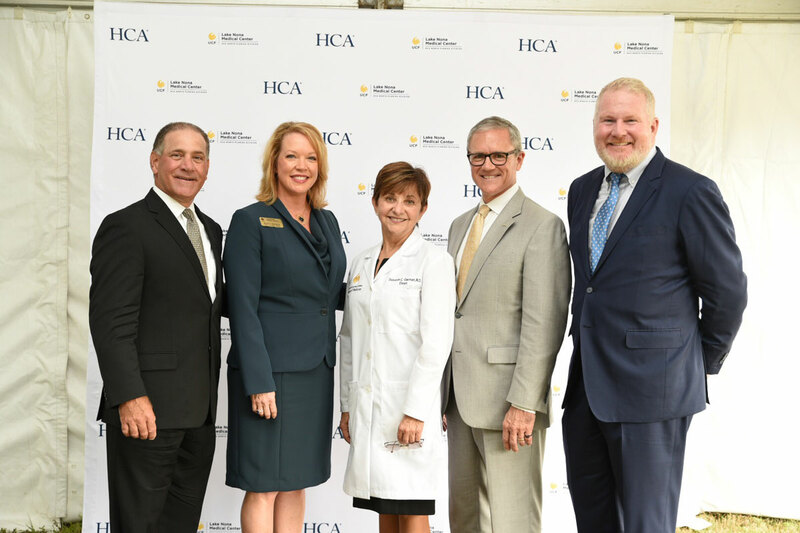 The gift comes as UCF and HCA partner to build the UCF Lake Nona Medical Center, a hospital next door to the medical school, and to open UCF’s new cancer research and treatment center at the former Sanford Burnham Prebys research institute. An endowed chair is one of the highest academic honors at a university and represents unparalleled academic prestige as a recognition of a faculty member’s excellence. The funds generated by an endowment often seed research projects – in this case, research into better cancer therapies and treatments. In American higher education, endowed faculty positions are often essential for recruiting and retaining the highest quality faculty. Dr. Deborah German, vice president for health affairs and dean of the UCF College of Medicine, said the endowed professorship will help the university hire an eminent cancer scholar to advance the medical school’s research mission. The chair will help lead the new UCF Lake Nona Cancer Center, which will diagnose and treat cancer patients with state-of-the-art established care and clinical research trials featuring new therapies. The center will also house UCF researchers who are studying the biomolecular, cellular and genetic aspects of cancer. HCA’s Sarah Cannon Cancer Institute will be part of the UCF cancer center. Sarah Cannon treats more than 1.25 million cancer patients a year and has more than 3,000 patients a year in cancer treatment trials. It has been instrumental in researching over 75 percent of the FDA’s newly approved cancer drugs over the past 10 years. HCA is one of the nation’s leading providers of healthcare services with 178 hospitals and 119 free-standing surgery centers in the U.S. and United Kingdom. It has 14 hospitals in North and Central Florida. HCA and UCF’s graduate medical education consortium has residency and fellowship programs in Gainesville, Kissimmee and Ocala with specialties that include surgery, internal medicine, psychiatry and emergency medicine. The consortium hopes to add more than 600 residency slots to the state by 2020 to help address Florida’s physician shortage. UCF Lake Nona Medical Center is expected to open in late 2020. HCA North Florida is contributing $175 million to build and to begin operating the hospital, and it will have 80 percent equity in the facility. UCF is providing the land and its strong academic brand and will have a 20 percent equity. No state dollars are being used to build the facility.